Yvette Nolan is a leading Algonquin playwright, director, and dramaturg in contemporary theatre. Her plays are piercing efforts to portray the lives of, and give a voice to, Canada’s missing and murdered Indigenous women. Proving that art and activism can go hand in hand, Nolan’s work has facilitated difficult conversations about the mistreatment of Indigenous communities and Indigenous women in Canada. 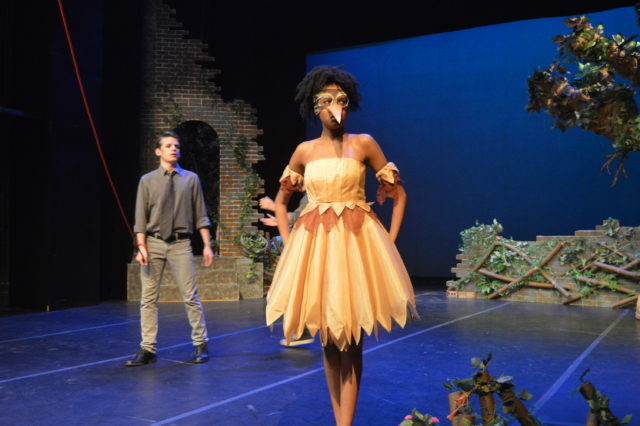 Nolan is McGill’s Mordecai Richler Writer-In-Residence this semester, and her adaptation of Aristophanes’ The Birds will be running until November 30. The McGill Daily sat down with Nolan to talk about her work and the upcoming play. The McGill Daily (MD): Your work is focused on giving voices to Indigenous people and cultures that have otherwise been silenced. The Birds seems so far removed from what you normally work on, so why did you choose it? Yvette Nolan (YN): And yet it’s not. It’s about two guys leaving a place and going somewhere new in search of a pure life, and they immediately try to change it to their own image. Wow! That’s just like the colonization story. It was so easy to reinterpret, and Aristophanes had so many cultural references from the time that it was easy to flip them and put in references from our time. Some things never change; that play is over 2,500 years old and it’s still the same old story. It was really easy to take it to colonization because the Greeks had their relationships with the gods, and we have relationships with divine characters and divinity in this world. As an Indigenous person who is fairly traditional, I decided that we wouldn’t be talking about the gods, and we’ll just bring the Eagle in instead. In my retelling, two men arrive from a place pointed east, and you feel as though they have landed in the west. They arrive there and they want to find a new way of life, except that they are not completely honest about that, and eventually one of them tries to colonize the area. He tries to monetize and commercialize the joint. That’s what we do when we find new territory: we look to see how we can make money off of it. The birds who had gathered in this place then feel invaded by the two guys. They reject the value system of the colonizers, but because they haven’t figured out what their own value system is yet, they are also a little bit tempted by what these men have to offer. All of this sounds very earnest, but it is actually funny. 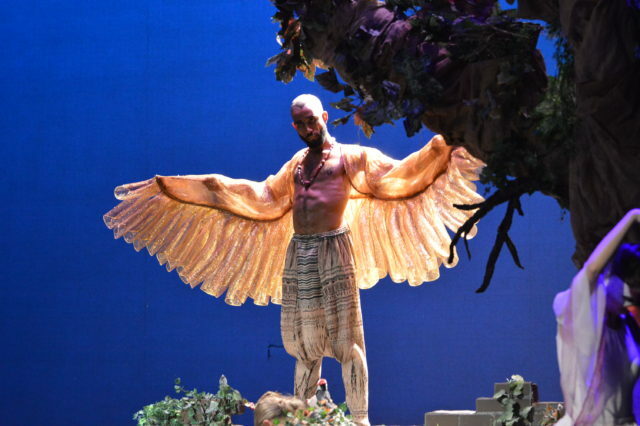 Because this play was a comedy, and because I stuck with the comedy of Aristophanes, the birds eventually reclaim their territory. It is a decolonizing story, which is something that we talk about in the world now. MD: How has your writing changed, or not changed, throughout your career? YN: I’m still writing about women and their place in the world; that sadly hasn’t changed. It’s kind of shocking to me – I spoke with a colleague about being a second-wave feminist and the things that we fought for then that we thought we achieved. At least back then we could clearly say, “this is not fair and we need equal rights,” and we all knew that we didn’t have that. MD: Do you find that the performing and/or writing of your work is a way for you to answer questions you have about things we haven’t figured out or reached yet? YN: Totally. One of the reasons I do theatre is to put order around chaos, as the world is chaotic, and we are trying to make sense of it. 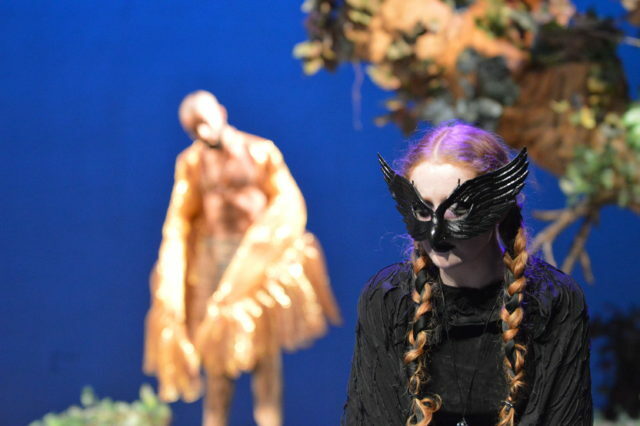 In theatre, we are also constantly trying out different stuff, and we are allowed to say things with characters that we might not be able to say as human beings, for whatever reason, whether we are trying to be generous or understanding of everyone’s journey, or we want to avoid conflict. But in the theatre you need conflict. We put people that have very different agendas together and then we see what happens. In watching their relationship, maybe we can crack something open and figure out what is going on. It feels safe because we have agreed to sit in this room together and we don’t have to be the people on stage, but we can have access to what they’re feeling, and we can decide which one of the characters we see as most similar to ourselves. Then, we can see how they interact with everyone else in the story. Maybe that can shift how someone sees the world. I know so many plays that have shifted how I saw the world. They shifted things in ways that I didn’t even understand in the moment, but which continue to inform me as a person now. MD: How do you situate yourself as an Indigenous activist and artist working within a white-dominated institution? YN: Here in the academy, we talk about Indigenizing the institutions and it’s not easy! There’s “inclusion Indigenization” and there’s “reconciliation Indigenization,” which translates to people saying that they are sorry and asking Indigenous people to partake in the spoils, but we still have to do this under structures. Then, there’s also “decolonizing Indigenization,” but no one has really thought about what that is going to mean. What would happen if we really changed the structure and the system? For me, it was interesting to do The Birds with a decolonizing agenda inside of the academy and with students at one of the big universities in the country. This place has produced a lot of people who served the colonizing agenda. It’s a little bit like being the sand in the oyster, as it’s about questioning what really people mean when they say “you guys” when talking about inclusion in university. We’re having this little discussion in our play about what exactly that means. MD: The Change the Name Campaign is significant and ongoing on campus. What are your thoughts on it? YN: The argument is that the campaign represents “inclusion Indigenization.” They tell us that “when we said R*dmen, we weren’t referring to Indigenous people; we just meant the team.” All I have to say is that I don’t care what you meant, because it still hurts my feelings and that should be enough. They say that our feelings should not be hurt because that’s not what they meant. But you’re not hearing me – my feelings are hurt, so now how do we move forward? They say, “well, don’t have hurt feelings.” This is as far as we’re getting; it’s just like the John A. Macdonald statue discussion, which, if we can’t have a discussion about John A. Macdonald statues without death threats and hate mail, then how do we actually move forward? Coming to McGill, I was very aware that it is very white and privileged, and it has this idea of itself, quite rightly, as a place of power and aspiration. This makes it a place for people to challenge themselves to become better, and I suppose that’s why it brings in people like me to be the sand in the oyster. But all places are white; that’s how things have been structured. I’m also pursuing a Master’s degree in Saskatoon in the Johnson Sheehan School of Public Policy, which is also extremely white. Part of that is historical – as Indigenous people went into postsecondary education, they chose law, education, and medicine, which are places that are going to matter to our people. They didn’t necessarily go into public policy. In fact, there were many places they didn’t necessarily go into because we were being streamed into the places where we could make changes for our people. But, at some point, we have to be in every aspect of society. So, my school, because it is a young school, only ten years old, it has a strategic priority to bring in more Indigenous people that they’ve been working on. When I meet with my advisor about my thesis, I say that I need an Indigenous faculty member on my committee, and he balks and says that we don’t have any, but then we talk about making that happen. This is talked about out loud, and that’s not to say that it is not white, as it is still very white, but it is in a very different place of recognizing that and understanding the kind of changes required. In one of my courses, there were five Indigenous students out of 18, and to not be the only one in the room makes such a difference! I don’t have to represent all Indigenous people! I’m Algonquin, but she’s Cree, and he’s Cree, and she’s Dené, and she’s Metis, and we all have different identities. That is how we begin to Indigenize our tiny class inside our tiny school – through our growing presence. 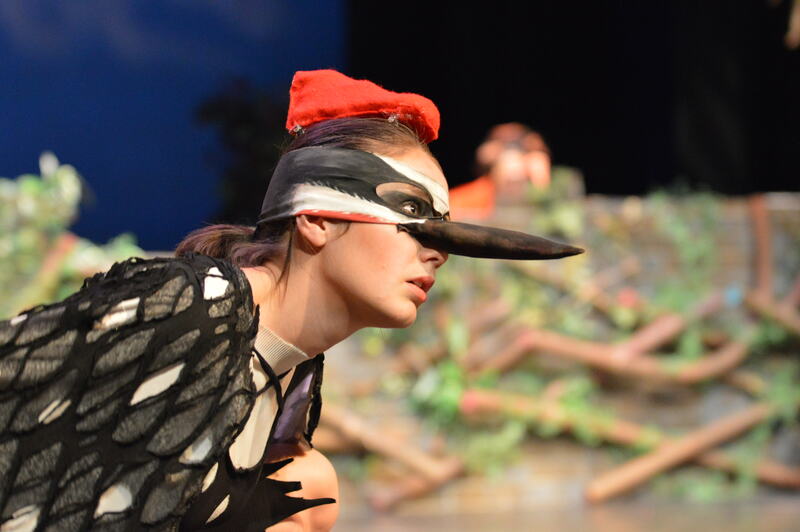 The Birds is showing November 28 – 30 in Moyse Hall.